At around 2p.m. on Wednesday September 6, 2017, a Nigerian presidential jet carrying Vice President Yemi Osinbajo, touched down at the airstrip in Makurdi, the Benue state capital and was received by Samuel Ortom, the governor. Mr. Osinbajo and his delegation – which included Audu Ogbeh, the Minister for Agriculture, and Babatunde Fashola, the Minister for Works, Power & Housing – were in town because only a week earlier, a flood triggered by a three-day rain had caused the River Benue to overflow its banks and soak the city. 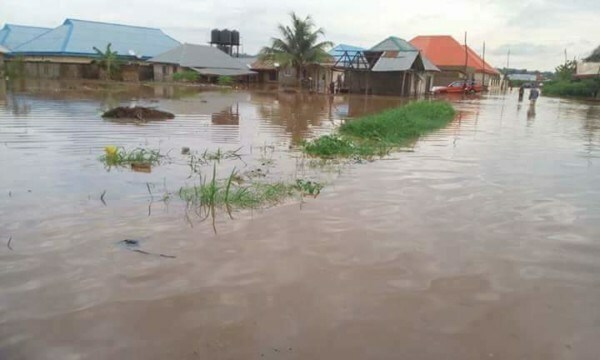 There were three fatalities and over 110,000 people in 2,769 households were displaced across 24 communities in the state during the August 27 floods, according to the Benue State Emergency Management Agency (SEMA). Internally Displaced People (IDPs) flocked to relatives in unaffected communities and to the two camps set up by the state government. The camp Mr. Osibanjo was scheduled to visit was an ‘ultra-modern international market’ built with red bricks commissioned by Mr. Ortom’s predecessor, Gabriel Suswam, in March 2015, but yet unassigned to traders. Before the VP’s plane touched down, some totally full 30-seater buses conveying Makurdi residents, reportedly drove in to top up its capacity. The motive was to give the visitors the impression of a camp in crisis mode, teeming with people and needing more supplies. Two of the IDPs who saw the buses come in, also confirmed the arrival to this reporter, hurling unprintable abuses at the government for ‘cheating us even in the small things.’ They also pleaded for anonymity in order not to bear the brunt of ‘unwarranted government attention’. Mr. Osinbajo who had no idea of the arrangement, followed his scripted schedule and went into town. He paid homage to the Tor Tiv, head of the state traditional rulers’ council and a former professor of agriculture, then visited disaster areas on the plains of River Benue in Makurdi. Within the IDP camp, he reiterated the federal government’s resolve to dredge the River Benue and construct drainages in the capital. “It is the concern of the president to put a more lasting solution to the flood which has ravaged parts of the country,” he said. Eight trucks of relief materials were provided in the interim and an additional five were on the way for victims, the vice-president announced. To the rest of the nation, the people of Benue who had been starved of presidential attention or instant acknowledgement of the disaster, had now been taken care of. It seemed like both state and federal governments were “on top of the matter”. But in Benue, like other parts of Nigeria, things are not always as they seem. A week after, there was a protest at the same camp. On Tuesday, September 12, the IDPs were going about life as they now knew it, utilising their meagre rations and making small talk, while waiting for a messiah to come with a solution to their predicament in the camp. Some claimed they had not been given food for days, while the camp store was full and locked. No such saviour surfaced. Instead, they had to stand up for themselves later that day as five vehicles including two Toyota Hilux trucks and an 18-seater bus loaded to the brim with relief materials from the store were navigating out of the camp premises. United Nations volunteer staff who tried to stop the convoy, were rough-handled by hoodlums allegedly colluding with SEMA staff. They barricaded the gate as they sang and wailed and overwhelmed the security men, preventing the vehicles from exiting the camp while complaining about the low rations in camp and the overall neglect. Emmanuel Antswen, Benue state correspondent of the News Agency of Nigeria who would visit the camps from time to time, wrote a report documenting the protest with pictures of the dissenting IDPs as they aired their disapproval. This was picked up by quite a few newspapers and the story went viral, embarrassing the authorities. Ten days later around 5p.m., the government’s anger crystallised as Mr. Antswen and his friends were at a roadside bar in an area of Makurdi called High-Level to get the weekend off to an early start. As they were drinking over regular banter and anticipating all-weekend bliss, a Peugeot 505 saloon car pulled up with some motorcycles. Someone pointed at him from afar. Mr. Antswen knew it was time to start making calls. As he was doing this, the police arrested him, leaving his friends, his car and his drink. The weekend had turned on its head for the poor journalist before it even began. After his bail, Mr. Antswen was cowed into silence. “I don’t have anything to say about Benue IDPs,” he told this reporter on the phone. “Go and talk to the government please.” IDPs and volunteers at the camp say his previously frequent visits to the camp had ended. His arrest was triggered by a petition from the state government that he had misrepresented the situation on ground, claiming N3 billion as damages for defamation of character and falsehood. But NAN stood by its story and defended its reporter. In a statement by Yusuf Zango, its editor-in-chief, it pointed out that Mr. Utsev who was coincidentally discussing with Mr. Antswen in the camp when the protests broke out, told the latter that he would investigate the matter. Just days before the protest, the camp manager was removed from his position. Days after the report, the SEMA boss, Boniface Ortese, was suspended. Before both got the boot, Benson Abounu, Mr. Ortom’s deputy and chairperson of the flood disaster management committee, swore to arrest officials circumventing the approved process for relocation of relief materials. So, was the NAN reporter telling the truth or was he mistaken in this case? The protest was the climax in a series of cumulative frustrations for the IDPs, some of whom said they had not been given food in three days. The smell of rotting onions and other foodstuff pervades the camp, one of them said. In the days after the flooding, there were loads of donations from several quarters; telecom companies, banks and other multinationals, celebrities like homegrown music star, Tuface Idibia, and his wife, Annie, as well as other individuals who donated millions of naira and relief items of all sorts. In its response to a Freedom of Information (FOI) request, the National Emergency Management Agency (NEMA) listed items it mobilised for both camps immediately after the flood: 3,600 bags of rice, 2,000 pieces of ceiling boards, 400 bags of cement, 7,942 blankets, 317 bundles of roofing sheets, 3,112 packets of zinc nails, 100 bales of fishing nets, 405 cooking pots, 205 pieces of men’s clothing, 1,680 pieces of women’s clothing, 1,490 pieces of children’s clothing, 4,820 pieces of wax print, 1,980 pieces of guinea brocade, 145 cartons of bathing soap, 107 bags of omo detergent, 160 foam mattresses, 6,000 plastic spoons, 492 plastic cups, 3,607 plastic plates, 1,703 nylon mats, 235 cartons of sugar, 50 cartons of tin tomatoes, 55 bags of 3-inch nails, 300 solar lanterns, 110 supple mats, 80 bath towels and 4,012 mosquito nets. The bulk of all the relief items never got to those for whom it was intended. Instead, they were locked up in the camp stores and a large government warehouse in the Welfare Quarters of the city. To circumvent bureaucracy and eliminate any diversions, some individuals learned to directly give items they were donating to families in the host communities or with the Zaaki (traditional ruler). One of these was a crowdfunding initiative on Twitter that helped raise N1.9 million to buy food, toiletries, sanitary pads, diapers, mats, blankets, drugs and mosquito nets. These items were delivered along with medical supplies donated by the Nigerian Air Force by Joy Nkar, a native of the state – whose Lagos-based friend Jola Ayeye had spearheaded the crowdfunding – to BENGONET, the body responsible for distribution at the International Market camp. Some of the supplies also went directly to the Achusa community and the Shelter Project that the UN Refugee Agency initiated in the Daudu area of the town. “Initially, I did my best to share whatever I took by myself and on the spot but the number of IDPs increased at some point so it became very difficult,” Ms. Nkar recalls. “I was going door to door at the main camp and house to house in Achusa community to share whatever I brought. Also, the officials in charge of the camp didn’t want that. They preferred that I handover whatever I had to them; they threatened to not allow me into the premises if I continued doing the sharing. Jennifer Msughter and her four kids lost everything when their apartment in the Gado Villa area was submerged. They escaped with only the clothes on their back so, Ms. Musghter’s ‘new’ clothes have come from new generation churches and she has no bras at all, like most of the women in the camp. Other than the provision of shelter within the market, there was little help from the government for her and other displaced persons. Families were given one mosquito net each, with four or five families squeezed into each of the stalls converted into makeshift rooms. Other IDPs who were wary of speaking on the record to this reporter, claimed that some of their peers had been forcefully decamped for talking to journalists or criticising the SEMA boss. There were protests in the other camp too but nothing changed. “Every time they complained, SEMA boss Boniface Ortese kept on saying wait, wait,” revealed the same volunteer who saw buses bring in people to deceive the presidential delegation. Eventually, that camp was closed. Contacted by PREMIUM TIMES, Mr. Ortese, the immediate past SEMA coordinator, denied being involved in diversion of food and supplies. “I’m yet to know anything like that. Allegations are street talk and people have freedom of speech so they can say anything they like,” he told this reporter. He said the matter was already in court and threatened to handover this reporter’s phone number to the State Security Service, SSS. “My friend, don’t implicate yourself. NAN is in court; there were false allegations like that so you have to be careful. NAN is unable to appear in court. I have been reassigned to the Office of the SSA on Politics. I have been reassigned to another office so I can’t comment on that,” he said. The bungalow in Makurdi that 40-year-old Dorcas Asen and her five children lived in with their neighbours, had the proverbial bull’s eye painted on its walls; it was not spared by consecutive flooding incidents in 2012, 2015 and 2017. Mrs. Asen has continued to return to the same building since the 2012 incident which was blamed on the Lagdo Lake Reservoir in Cameroon overflowing that September. That year, she and her family stayed with other IDPs in the government-owned camp at St. Catherine School behind the railway market but after the 2015 and 2017 incidents, they were domiciled at the International Market. Unlike Mrs. Asen, some stayed back in the host communities, preferring to live with friends and families, rather than within the government-run camps. Their fears stem from a lack of trust in the government, dating back to the aftermath of the 2012 floods. Government officials got those living in affected areas to fill forms even as the state Ministry of Environment fumigated those areas to minimise the risk of an epidemic spreading. Nothing came of it. Ayange Raymond, then a final year student of English Literature at the Benue State University, who lived in the Gyado Villa area of Makurdi, said for losing some of their belongings, the state government compensated him and other students in the area with a packet of the popular Indomie noodles each. Some 1,700 people currently remain in the International Market Camp, depending on government handouts. The rest of the city is back on its feet, thanks to the private individuals who have stepped in to fill the void. But tragedy could repeat itself yet again. Makurdi remains a city with low-level and high-level areas; the possibility of another overflow and the potential loss of lives and property remains high. Regardless of the timely warning issued by the Nigerian Meteorological Agency (NIMET) in its 2017 Seasonal Rainfall Prediction (SRP), no stop-gap solution was put in place last August. As it stands, no long-term solution is being implemented to forestall future occurrences; even the promised dredging of the River Benue is yet to begin. Benue State with a population of a little over 4.2 million people (2006 census), gets N3 billion in allocation from the federal purse – in addition to approximately N250 million in internally-generated revenue (IGR) each month. According to the Office of the Accountant-General of the Federation, an additional amount (0.72% for the states and 0.60% for each of the 23 local government councils) is paid as ecological fund allocation monthly. Only a fraction of this trickles down to the people. The Economic & Financial Crimes Commission (EFCC) is currently investigating the immediate past governor of the state, Gabriel Suswam, for alleged diversion of N6 billion of Ecological funds allocated to the state over the course of eight years. Terver Akase, chief press secretary to Mr. Ortom, also specifically alleged that Mr. Suswam had diverted N2 billion released by the FG in 2013, from the ecological fund. This report was supported by the BudgIT 2017 Civic Media Fellowship.